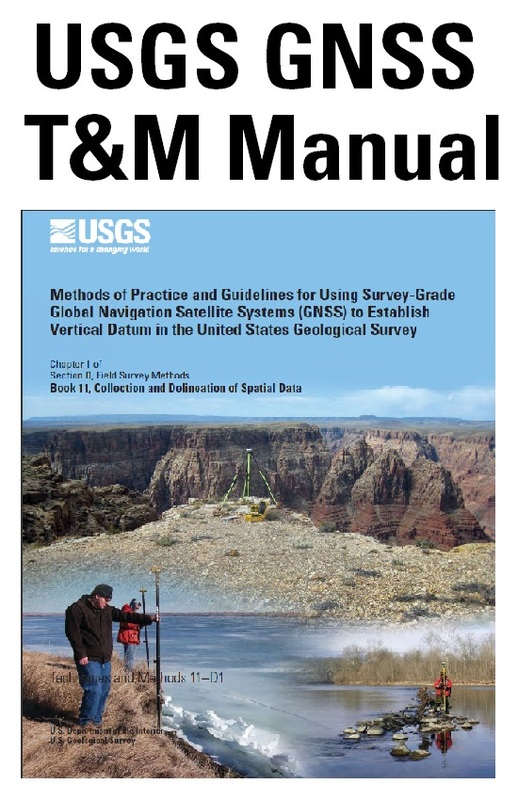 Mission: The USGS Global Navigation Satellite System (GNSS) committee provides information and guidance on the latest applications and surveying methods to maintain a high-level of consistency and quality amongst the GNSS community within	the USGS. Handheld units available from commercial retailers are designed for recreation or general commercial use. These units are good for general location and navigation with simple waypoint marking. They range in price up to about $600. The above commercial grade handheld GPS units are not designed for precise or extensive mapping and data collection. They are best for navigating to a location in the field or for simple coordinate determination of a point. 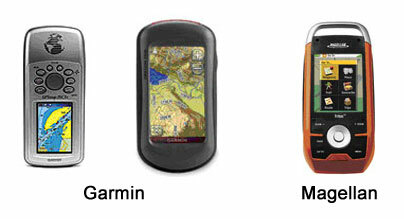 Most brands of GPS handhelds come with base maps installed and detailed maps available for purchase. Base maps generally are not detailed enough for navigation and the purchase of detailed maps is recommended. When determining location coordinates, several GPS handhelds offer an averaging option to obtain coordinates that are more accurate. This averaging option should be used if available. Commercial grade handheld GPS units are able to obtain coordinates with a horizontal accuracy of approximately 3 meters if the unit can receive a wide area augmentation system (WAAS) signal; otherwise, the accuracy is approximately 10 meters. This type of GPS handheld unit provides elevation data with poor accuracy. A general GPS discussion from Garmin including WAAS. Differential grade GNSS equipment differ from commercial grade GPS units by incorporating higher quality antennas and implementing differential corrections that greatly improves the accuracy of the location. Differential grade GNSS equipment incorporating high quality antennas can receive information from a greater number of satellites at once, some can receive information from the satellites in several frequencies (L1 and L2), and some can receive information from satellites in different satellite systems (primarily GPS and GLONASS). Differential grade antennas receive corrections from either a satellite based augmentation system (SBAS) or ground based augmentation systems (GBAS). SBAS include WAAS, European Geostationary navigation Overlay Service (EGNOS), Multi-functional Transport Satellite (MSAS), and commercial versions like OMNISTAR and StarFire. The accuracy of the SBAS and the GBAS corrections depend on the type of system being used and the users location in relationship to the systems coverage. In addition differential grade units typically have higher quality mapping software designed to map features using points, lines, and polygons. These units range from $500 to $10,000 with software. The key to utilizing differential-grade GNSS systems is their ability to apply differential corrections to positions. There are several different ways to apply these corrections. One method is to post-process the data after it is collected with data from a nearby base station such as a Continuously Operating Reference Station (CORS) which are managed by the National Geodetic Survey. This post processing is typically completed using vendor software however real time corrections are more commonly used. The types of real-time corrections that can be used depend upon the mapping grade unit. Almost all of the mapping-grade units are capable of receiving WAAS corrections. However, WAAS is problematic for users in higher latitudes (especially north of 71 degrees latitude) because of the location of the WAAS satellites. Other SBAS used by differential-grade GNSS are Europe’s EGNOS and Japan’s MSAS. DGPS beacons also provide free real-time correction signals. U.S. beacon coverage can be viewed at http://www.navcen.uscg.gov/dgps/coverage/Default.htm. For compatible receivers, Trimble offers a SBAS with limited coverage (http://www.trimble.com/mgis_vrsnow_h-star-US.shtml) called the H-Star subscription service. 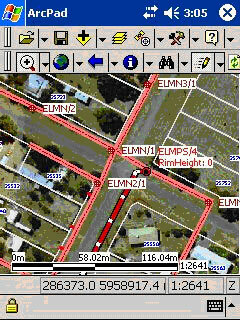 Though coverage of this system is currently limited arrangements can be made with Trimble for coverage in specific areas. OMNISTAR, a SBAS with global coverage, has three levels (differ in the accuracy) of subscriptions available for real-time corrections. but. Another global SBAS subscription service is the StarFire subscription service from NAVCOM (a John Deere Company). There also are local real-time GPS networks in some areas, for example the Washington State Reference Network (http://www.wsrn.org/about.aspx). GBAS such as beacons also provide free real-time correction signals. U.S. beacon coverage can be viewed at http://www.wsrn.org/about.aspx. The differential grade GPS units use mapping software for data collection and post processing. Some software is brand specific like Trimble’s TerraSync, Topcon’s TopSURV, or Sokkia’s IMap, other mapping software used by many of the differential-grade units are generic, such as ESRI’s ArcPad software. Often the mapping software must be purchased separately. Accuracy of differential-grade GNSS units varies depending upon the type of differential correction applied and the quality of the GNSS receiver and antenna (type, quality, and the number of satellite and frequencies that can be received), with external antennas typically providing the best results. All Differential-grade GPS receivers have a horizontal positional accuracy of less than 1 meter. Most new GPS receivers with differential corrections from SBAS such as WAAS and low level OMNISTAR subscriptions or from GBAS such as beacons typically have accuracies from 0.3 to 1.0 meter, depending on the quality of the receiver. Higher-level OMNISTAR service or Trimble’s H-Star service improves the accuracy to 5 – 30 cm. Currently, the highest quality differential GPS receivers available are dual frequency units that utilize both GPS and GLONASS satellites. These coupled with a very accurate differential correction subscription will give the best differentially corrected position possible. Vertical accuracies for these GPS units are 2 – 3 times that of the horizontal accuracy, and should be used only for informational purposes. Requirements for survey-grade GNSS receivers are that they record the full-wavelength carrier phase and signal strength of the L1 and L2 frequencies and they track at least eight satellites simultaneously on parallel channels. These dual-frequency receivers limit the effects of ionospheric delay and, increase the reliability of processed results over long baselines. Receivers should have sufficient memory and battery power to record 6 hours of data at 5-second epochs. All receivers should be upgraded with the latest manufacturer's firmware after discussing equipment and use with a company representative to ensure compatibility. The antennas used for GNSS survey applications should have stable phase centers and be designed to minimize multipath interference. 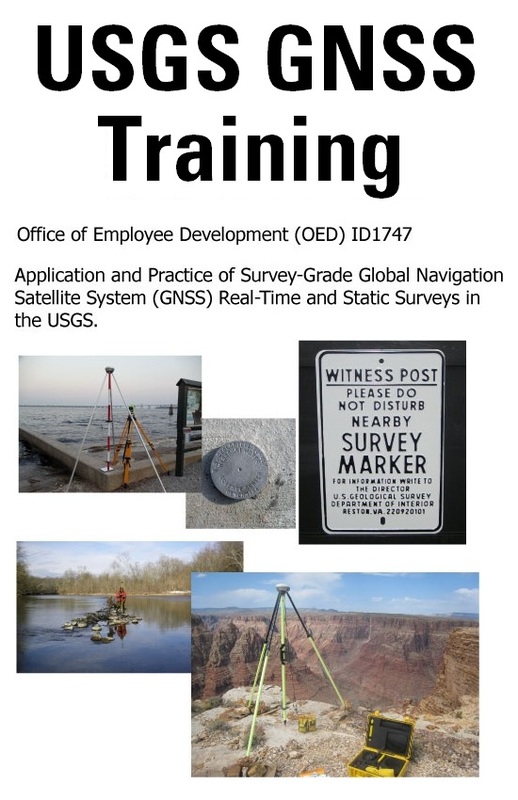 The surveyor must know the exact phase center offsets for their GPS antennas for post processing purpose, this data is typical printed on the antenna or in the user’s manual or it can be found on the NGS antenna calibration page. Inappropriate offsets can introduce up to 10 cm of error in survey results.Other equipment that is necessary when using survey grade GNSS equipment are fixed-height tripods. If possible, all tripods should be the same height as any other fixed-height tripod on the project so measurement and recording errors are eliminated. Also, field personnel should make sure that the level bubble is in adjustment, center rod is not bent or damaged, height of center rod is correct as reportedly measured, and legs are secure. Roving poles also should be fixed height or set to a consistent height and measured in the field for verification of height. It is the surveyor's responsibility to know the accuracy requirements of the survey and match this with the accuracy of his or her receiver in combination with the accuracy of the correction information being received based on correction quality and location (how close the survey is to the area were the corrections are being calculated so the assumption of similar ionosphere corrections is not violated). Most survey grade equipment has horizontal and vertical accuracy based on distance (see table below). Therefore when roving in RTK mode the vertical accuracy of the surveyed points in relation to the base station 8 km away is 2 cm + 1.6 cm or 3.6 cm. The further a survey is from the correction information, the less accurate the survey. When accuracy is described in relation to a datum the quality or error in the benchmark being surveyed from and the models being used must be considered. Typical error in Geoid03 model is 4.8 cm (http://www.ngs.noaa.gov/GEOID/geolib.html, Assessment of the New National Geoid Height Model, GEOID03 link) and 3 cm in the GRS80 ellipsoid. In addition it must be noted that all GNSS derived elevations, though proven through time to be fairly accurate, are only modeled results. Orthometric heights (or elevation) are simply calculated as the ellipsoid height minus the geoid height (both modeled values based on location). That is why it is important to included high order leveled vertical reference marks (typically NGS benchmarks) when relating your survey to a given datum or your survey area is very large. Kinematic is a term applied to GPS surveying methods where receivers are in continuous motion, but for relative positioning the more typical arrangement is a stop and go technique. This approach involves using at least one stationary reference receiver and at least one moving receiver called a rover. RTK procedures do not require post processing of the data to obtain a position solution. A radio at the reference receiver broadcasts the position of the reference position to the roving receivers. This allows for real-time surveying in the field and allows the surveyor to check the quality of the measurements without having to process the data. 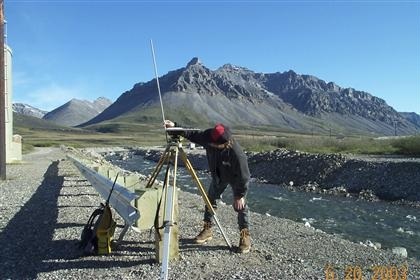 Static GPS surveying was the first method used in the field and it continues to be the primary technique used today. Static surveys allows for systematic errors to be resolved when high-accuracy positions are required by collecting simultaneous data between stationary receivers for an extended period of time, usually 30 minutes to 4 hours, depending on baseline length. 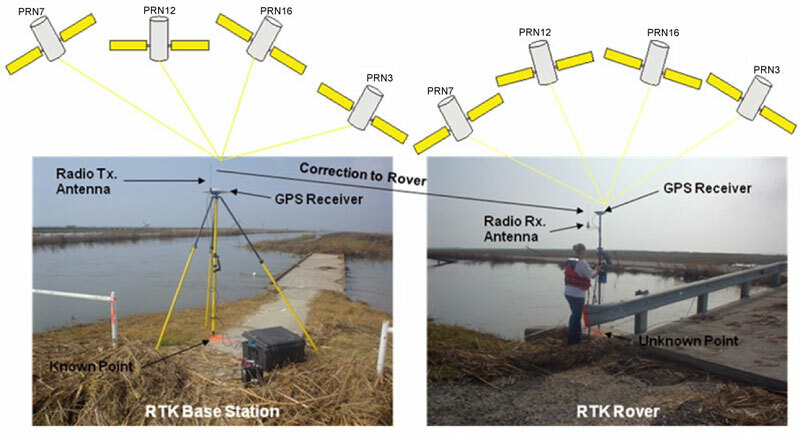 Using this method requires the design of a GPS network and an observation schedule for the coordination of receivers. Fast static is a procedure that uses very short occupation times. Unlike static methods, which sometimes require multiple occupation session to build redundancy into the network, rapid-static stations need to be occupied only once. PPK surveys are similar to RTK procedures, but the baselines are not processed in real-time. PPK involves using one or more roving receivers and at least one reference receiver remaining stationary over a known control point. 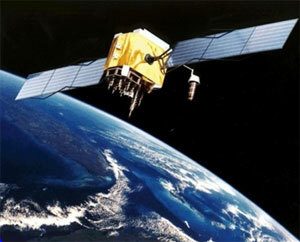 GPS data are simultaneously collected at the reference and rover receivers. The data are downloaded from the receiver, and the baselines processed using GPS software. When choosing between a kinematic and a static methodology, the GPS surveyor basically is making a choice between productivity and accuracy. There is no doubt that the short sessions of the kinematic procedures can produce the largest number of GPS points in the least amount of time;however, because of the shortened occupation times and less data to resolve integer ambiguity, there is a slight degradation in the accuracy of the work. Currently (2010) in the United States, the Global Positioning System (GPS) is the only fully functional satellite system in the world. Approximately 24 government operational satellites are available, along with other satellites, that may be used as substitutes for those rendered inoperable. For more information on the current constellation, visit the GPS constellation provided at the United States Naval Observatory, Time Service Department (http://www.usno.navy.mil/USNO/time/gps/current-gps-constellation). As of June 1, 2009, the Russian government operated GLObal NAvigation Satellite System (GLONASS) consisting of 17 operational satellite vehicles (SV’s) and have an additional 3 SV's under maintenance. A recent update and withdrawal of one SV from service August 18, 2009, left the constellation with 19 functioning SV’s, one of which was set unhealthy since June 18, 2009. An additional set of three GLONASS SV's are scheduled for launch in December 2009, with the scheduled achievement of a fully functional system (24 satellites) by the end of 2010 (www.gpsworld.com). The system requires 18 SV's for continuous navigation services covering the entire Russian territory and 24 SV's to provide services worldwide (www.gpsdaily.com). The European Union, together with the European Space Agency, has introduced a proposed GNSS known as the GALILEO positioning system. This system is anticipated to be a fully functional system by 2013 that is compatible with the United States operational GPS system and Russian GLONASS. The fully functional system will consist of 30 SV's and associated ground infrastructure (www.insidegnss.com). An existing regional navigation system known as "Beidou" is proposed by the Chinese government to develop into a global navigation system named COMPASS by 2015. The system is proposed to consist of 30 SV's and associated ground infrastructure. The Chinese government has announced cooperation with other countries in the creation of COMPASS (http://en.wikipedia.org). Currently (2010), most real-time and post-process GNSS surveying utilizes anywhere from 4 to 12 GPS SV's in the United States with an additional 3 to 4 SV's received from the GLONASS network. Survey grade GPS users are benefiting from the extended constellation, thereby resulting in more accurate positioning. Real-time GPS survey users also are benefiting from more rapid fixed positioning in which to obtain solutions. Here is a discussion regarding radio frequencies and appropriate authorization for GNSS radios. Comments listed here are from the USGS Radio Liaison Officer (RLO), Richard Pardee (rwpardee@usgs.gov), who has copied the USGS Radio Program Manager, Jerry Godbey (godbeyj@usgs.gov). "Being part of the federal government, we are not required to have an FCC license for operation of this equipment on our frequencies. Our use of the frequency spectrum is not governed by the FCC. Instead, we operate under the management of the National Telecommunications and Information Administration (NTIA). The NTIA coordinates with the FCC in the management of the spectrum. In the majority of cases, the equipment manufacturer is required to obtain an FCC license for their equipment. We use this licensing as one method of determining whether or not we authorize the use of a piece of equipment by federal users. This is due to the fact that, through the FCC testing and licensing processes, the equipment has been proven to meet certain requirements. Not all equipment used by federal users is necessarily FCC licensed. However, much of it is. One other difference is that specific frequency use by federal users is determined by the NTIA and is not necessarily the same as the frequency being used by non-federal users that are using the same equipment. That is where we must follow the guidelines of the NTIA for the authorized frequency on which a piece of radio frequency (RF) equipment can be used. The department has restrictions as well. For DGPS and RTK type equipment, we do have specific frequencies to use. DOI users are required to request from their Departmental Radio Program Manager (RPM) via the bureau Radio Liaison Officer (RLO), the authority to use RF equipment. Being the RLO, I can tell you if the equipment is authorized for use, the frequencies that are authorized and whether or not a Radio Frequency Authorization (RFA) has already been generated for that frequency (or if one needs to be generated). Using one that already exists cuts down on the wait time. Your equipment supplier should know the process of programming the equipment for use on the federal frequencies. That supplier may request documentation authorizing the use of the frequency. I can supply that info if requested. The 410 MHz to 430 MHz frequency band is a federal band. Our DGPS frequencies are between 410 MHz and 420 MHz. Authorized frequencies are dependent upon the equipment characteristics and the geographic location of the user. If you can send me your equipment info and location, I can tell you the specifics on the frequencies that are authorized. Often, adjoining states like to share equipment and/or information and want to be on the same frequency. With shared frequencies, that is usually pretty easy. Regarding the existing frequencies and whether or not they are authorized, I can look into that as well, just let me know the equipment and frequencies. Please feel free to let me know if you have any questions. I've included Jerry Godbey in this response. He is the USGS Radio Program Manager."